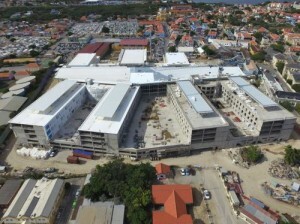 WILLEMSTAD - Coming Saturday, September 16th, the financial institution, SONA Foundation, together with main contractor Ballast Nedam, will hold an open house to give the public the opportunity to take a look at the new hospital under construction in Otrobanda. Between 9 am and 1 pm, one can register at the entrance of the HNO project on the Colon side where visitors are registered. According to an expanded route, visitors can take a look at the latest progress in the construction of the hospital that will be delivered at the end of next year. Here and there, signs are posted along the route where further information is provided about components of the building. In addition, in the open space, there will be an information stand where questions can be answered. Everyone is advised to come with closed footwear for their own convenience because in any case, it is a building site where materials and equipment can be found everywhere.